The event fit perfectly into the ‘pro-PSU’ narrative that the Congress has been carefully building around the Rafale deal. 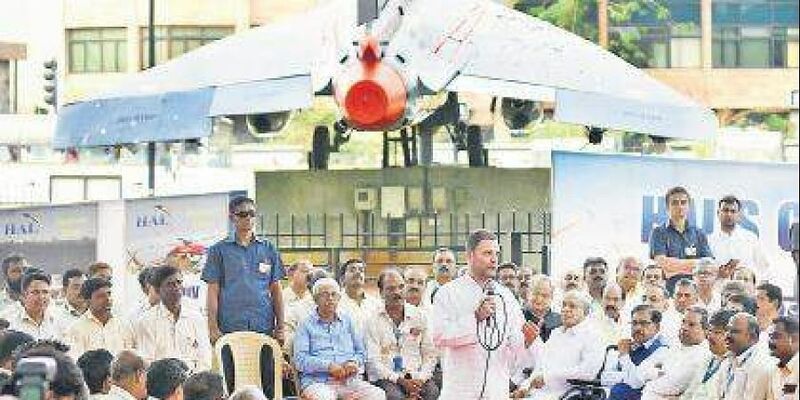 BENGALURU: Under the Hindustan Aeronautics Limited’s (HAL) coveted Tejas installation at Minsk square in Bengaluru, Congress president Rahul Gandhi on Saturday accused the Narendra Modi government of brazen corruption. In an interaction with current and former employees of HAL along with trade union members, he tore into Defence Minister Nirmala Sitharaman for questioning the capacity of HAL to manufacture Rafale but not raising as much as a finger about Anil Ambani’s company. Despite referring to the meeting as an ‘apolitical’ event, former employees ended up patronising the Congress and condemning the Union government. “This Rafale aircraft is your right. You have the experience to build the plane,” he told the gathering. “Every person here made it clear their future is being taken away. We are defending those who are defending the nation from this government,” he told the media after his round-table interaction with former and current employees of HAL. The event fit perfectly into the ‘pro-PSU’ narrative that the Congress has been carefully building around the Rafale deal. A round-table setup to build a ‘one amongst you’ perception worked in favour of Gandhi who went about shaking hands with people soon after his arrival. Despite a directive from the management asking employees not to attend the event, dozens of employees of the HAL in uniform and ID cards walked into the makeshift venue set up right opposite the PSU’s corporate office. Former employees even addressed the gathering highlighting the ‘insult’ meted out to them by the Union government. Many employees were not willing to talk about their participation. Former staff attributed it to the atmosphere of fear created by the HAL management. “For the first time, I am seeing them issue a circular, directing employees not to attend this function. Many employees would have come but because of the situation of fear they have not. It is illegal and uncalled for,” said Sirajuddin, an ex-employee who served HAL for 40 years. Gandhi also demanded the government apologise for deeming HAL incapable of manufacturing Rafale jets. Post Rahul ’s opening remarks, former employees of HAL were invited to speak about the PSU, its capabilities and their opinion of the offset arrangement of Rafale deal being given to Ambani’s company. “HAL is legitimately entitled to get the Rafale project. A big campaign is required against privatisation. Senior leaders considered these public sector organisations as the temples of modern India,” said Mahadevan, former general secretary of the employees union. Rahul Gandhi was quick to pick up this sentiment to attack the Union government. In his closing address, Rahul Gandhi assured employees of HAL that he would fight for them. 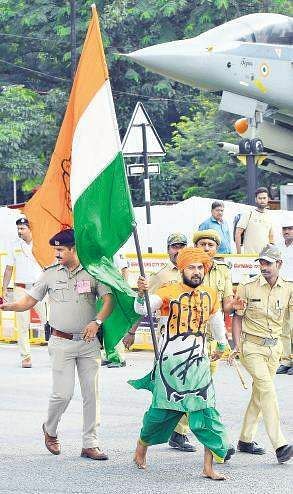 The Congress made it a point to repeat several times that the party president had visited Bengaluru for the sole purpose of meeting HAL employees. At the end of the session, Gandhi demanded that the government apologise to the HAL and its employees for deeming them incapable of manufacturing Rafale jets.